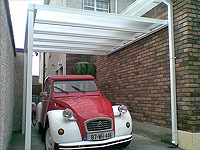 Attractive Domestic Canopies and Car Ports in White or Brown. Provide excellent weather protection for Patios, Car, Bicycles and outdoor toys. Can be manufactured and installed to any size. Integral rainwater guttering. Clear or tinted polycarbonate glazing.